Astronauts, apart from living happy lives back on Earth after the fact, should be spending most of their time either in space or communicating science to the masses – or both. 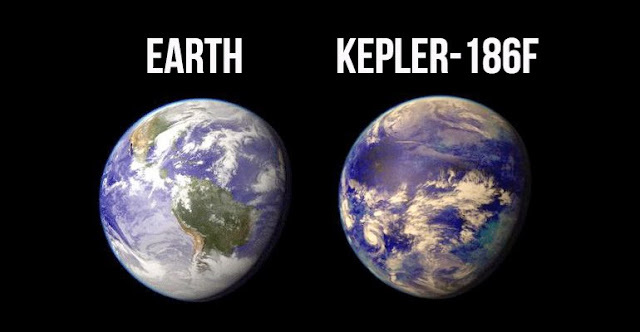 They should not have to waste any time arguing with flat-earthers on TV, nor should they have to shut down the President of the United States. Sadly, although a new year has begun, this is the age of Alternative Facts. Shortly after ending 2017 on a mind-achingly sad comment about climate change science, Trump started 2018 as he meant to go on: tweeting inflammatory remarks, including one in response to North Korea's drama-matching leader, Kim Jong-un, wherein he spoke of an omnipresent nuclear button on his desk. 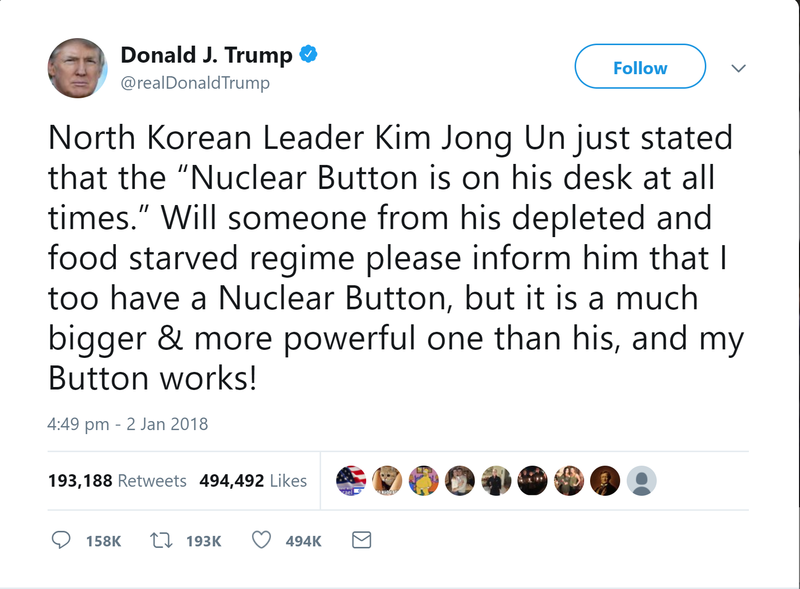 Apart from being the most nauseating and concerning genital measuring contest in human history, this is clearly not how nuclear strikes are launched, and anyway, the physical size of the button is irrelevant to how many nukes it could hypothetically launch. 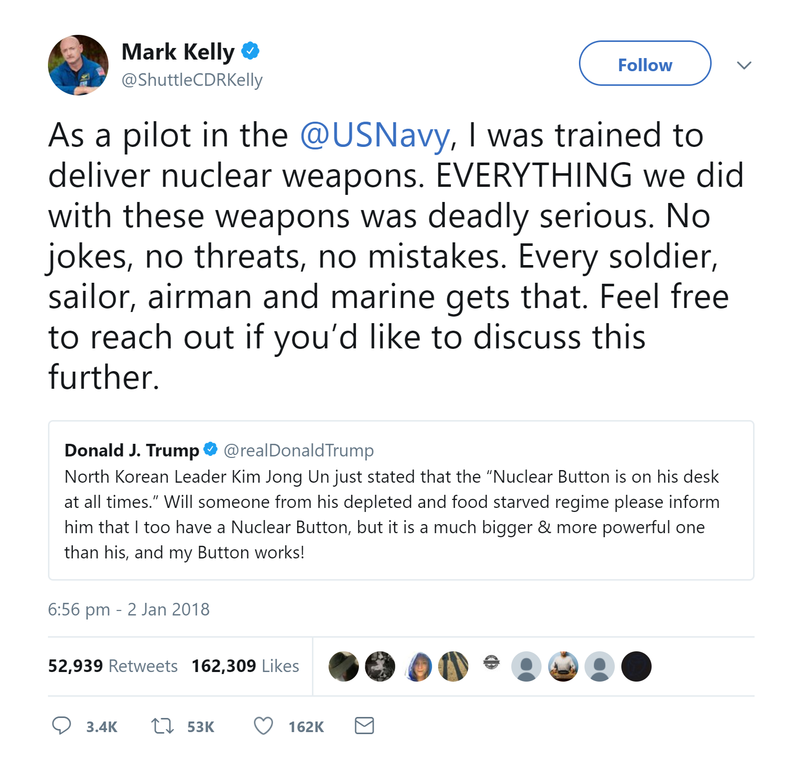 Weirdly, this was probably Trump’s attempt at a metaphor, where the button referred to the size and destructive capability of America’s nuclear arsenal. 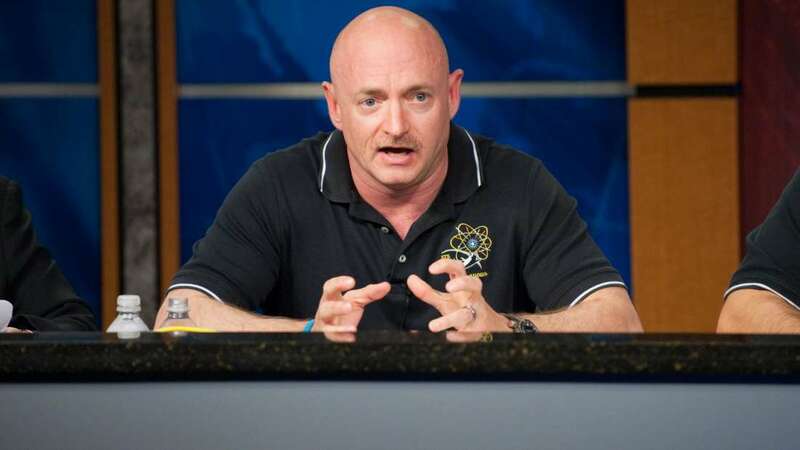 In any case, it’s obviously ridiculous to taunt a volatile nuclear power like this, which is why one Mark Kelly – a retired astronaut, and brother of fellow spacefarer Scott Kelly – decided to step in, as spotted by the Washington Press. 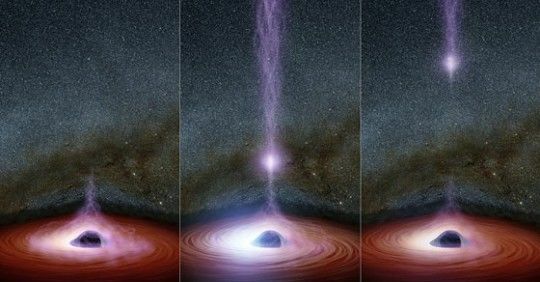 Trump hasn’t replied to this purveyor of the cosmos at the time of writing, and he’s unlikely to. Kelly, for one thing, is simply too on the ball for a linguistically challenged President to fend off. 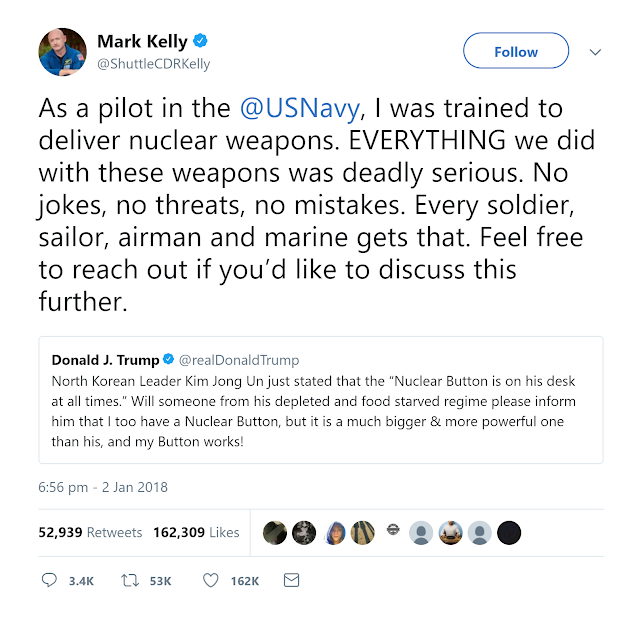 Shortly beforehand, Kelly spotted another of Trump’s tweets. Although not exactly inflammatory, it makes a claim which is beyond ludicrous. Now, clearly, nothing Trump has done has had an effect on the safety of air travel. There’s no evidence to suggest anything has changed in this regard, especially on Trump’s orders. 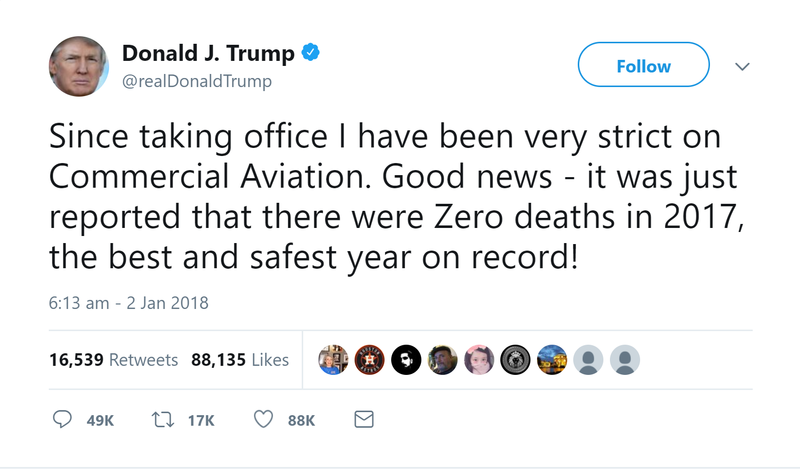 Air travel has indeed never been safer, but Trump claiming credit for this is like a hamster taking credit for writing Wonderwall by Oasis. It would be funny, if it wasn't so offensively daft. 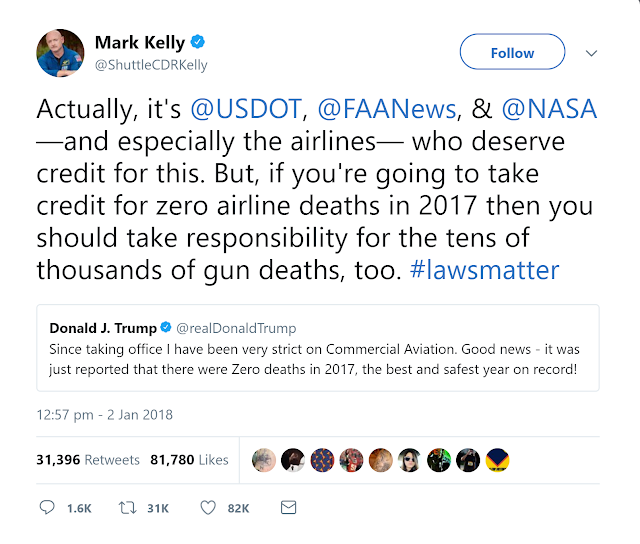 Kelly took another shot at the Tweeter-in-Chief, using nothing but factual information and one hell of a slap down at the end. 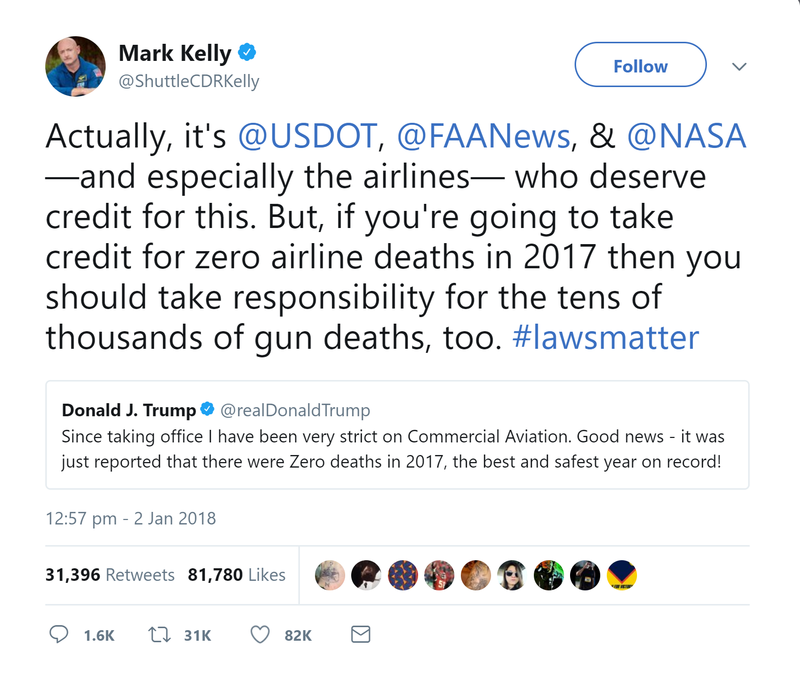 We, for one, hope that Kelly keeps this up. Maybe it’s the Britishness in us coming out, but sometimes the best form of resistance is a strongly worded letter – or tweet, in this case.